11 “There was a man who had two sons. 12 The younger of them said to his father, “Father, give me the share of the property that will belong to me.’ So he divided his property between them. 13 A few days later the younger son gathered all he had and traveled to a distant country, and there he squandered his property in dissolute living. When he had spent everything, a severe famine took place throughout that country, and he began to be in need. 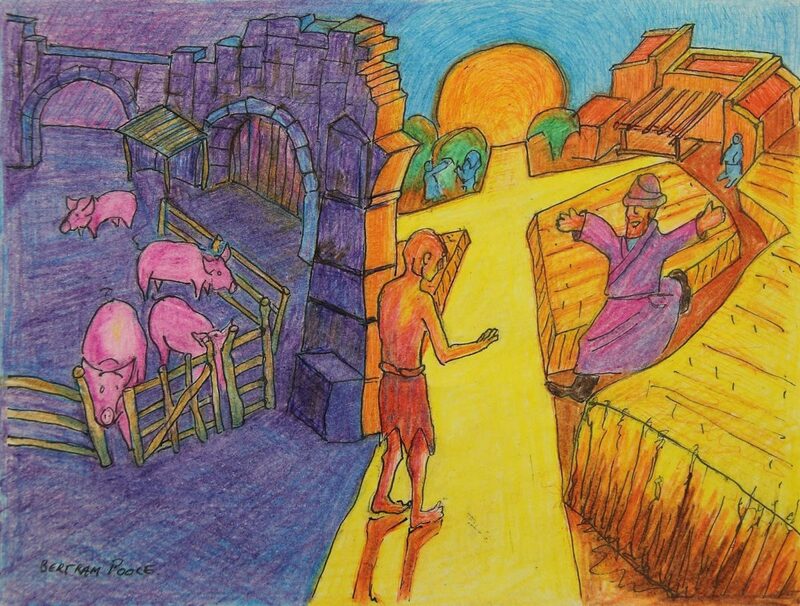 15 So he went and hired himself out to one of the citizens of that country, who sent him to his fields to feed the pigs. 16 He would gladly have filled himself with the pods that the pigs were eating; and no one gave him anything. 17 But when he came to himself he said, “How many of my father’s hired hands have bread enough and to spare, but here I am dying of hunger! 18 I will get up and go to my father, and I will say to him, “Father, I have sinned against heaven and before you; 19 I am no longer worthy to be called your son; treat me like one of your hired hands.” 20 So he set off and went to his father. But while he was still far off, his father saw him and was filled with compassion; he ran and put his arms around him and kissed him. 21 Then the son said to him, “Father, I have sinned against heaven and before you; I am no longer worthy to be called your son.” 22 But the father said to his slaves, “Quickly, bring out a robe—the best one—and put it on him; put a ring on his finger and sandals on his feet. 23 And get the fatted calf and kill it, and let us eat and celebrate; 24 for this son of mine was dead and is alive again; he was lost and is found!’ And they began to celebrate.